You are going to love this healthy Brazilian Chopped Salad, Salada de Palmitos, with tons of perky flavor and crunch! It’s salad season! Who’s excited?! If you are not a salad lover, I’d like to suggest that there’s a chance you’ve been eating the wrong kinds of salads. Slimy over-dressed greens with a little bit of carrots and unripened tomatoes, right? Or maybe those weird restaurant “after-thought” salads with the chunks of raw broccoli that are too big to fit in your mouth? I hear you… Salads can be painful. 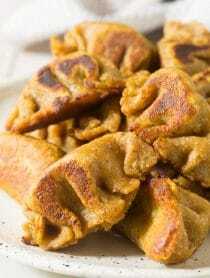 However, they can also be ridiculously exciting with tons of color, contrasting flavors, and crunch! 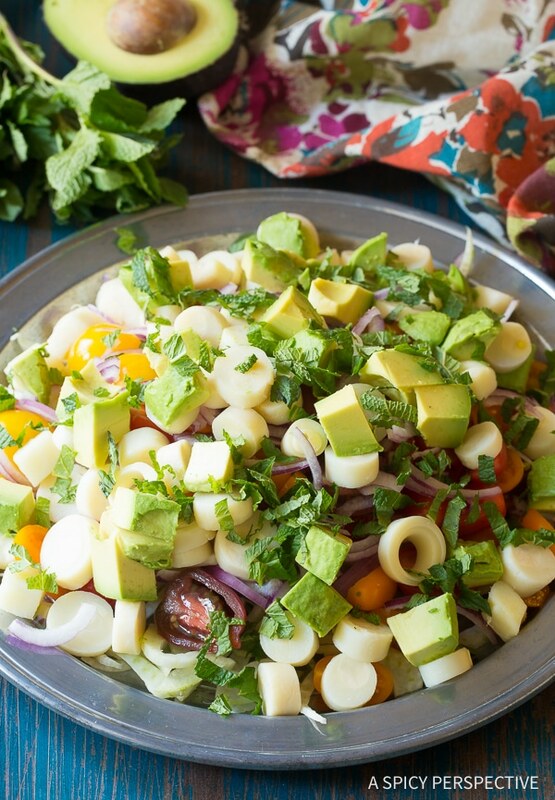 Introducing Brazilian Chopped Salad, AKA Hearts of Palm Salad or Salada de Palmitos. It’s bold and zesty with soft tangy slices of hearts of palm, and cool sweet notes of fresh fennel and tomatoes. This particular version also includes creamy avocado, sharp red onion, and an herbaceous kick from fresh chopped mint! As if that weren’t enough all these flavors and textures are tied together by a simple perky garlic-lime vinaigrette. 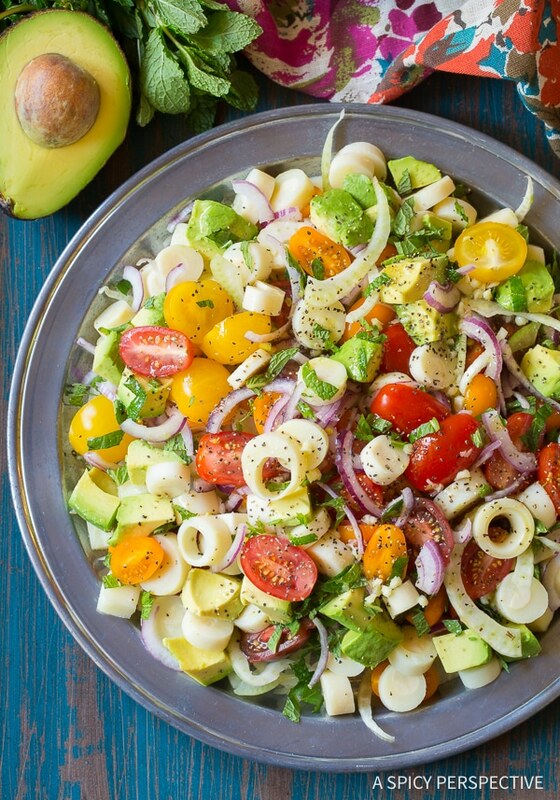 Brazilian Chopped Salad is all a raw vegetable dish should be, and more. 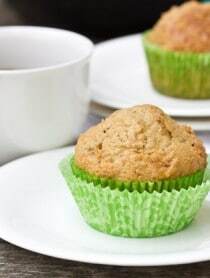 Bold and surprising, with a hefty load of healthy vitamins, minerals, and fiber. It’s salad bowl utopia. Like taking a bite of a grilled cheese sandwich and discovering it has bacon on it, this Brazilian Chopped Salad recipe is pleasantly so much better than expected. 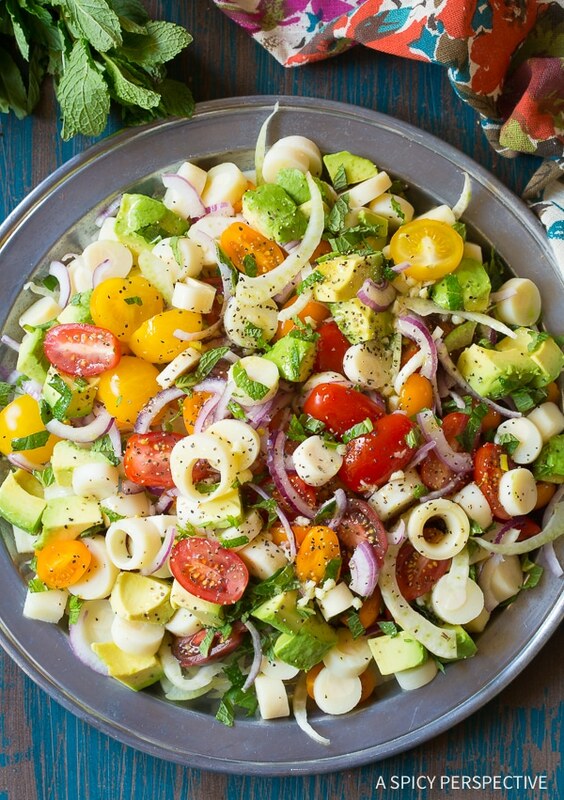 If you are looking for light and lean recipes to add to your kitchen arsenal, give our Brazilian Chopped Salad a try. 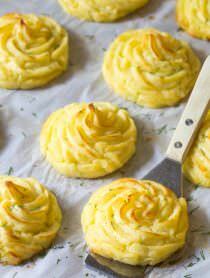 You may find yourself converting your meat-n-potatoes friends to the green side! Brazilian Chopped Salad Recipe (Salada de Palmitos) A zesty gluten-free and vegan salad with tons of crunch! 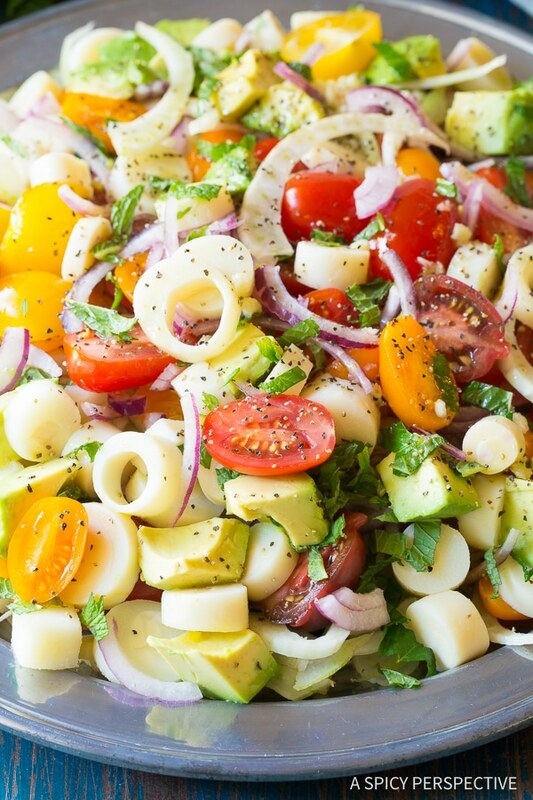 Made with hearts of palm, tomatoes, avocado, fennel, mint and lime. For the vinaigrette: Pour all the ingredients in a jar. Add 1 teaspoon salt and 1/2 teaspoon ground black pepper. Screw the lid on tight and shake to combine. Drain the can of hearts of palm, then chop into 1/4-inch rounds. Cut the tomatoes in half. Cut the stems off the fennel bulb. Then cut the bulb in half and remove the core. Lay the fennel bulb halves flat, and slice into thin "shaved" pieces. Cut the avocado into chunks. Cut the onion half, in half again, then slice into thin strips. Finally, chop the fresh mint. 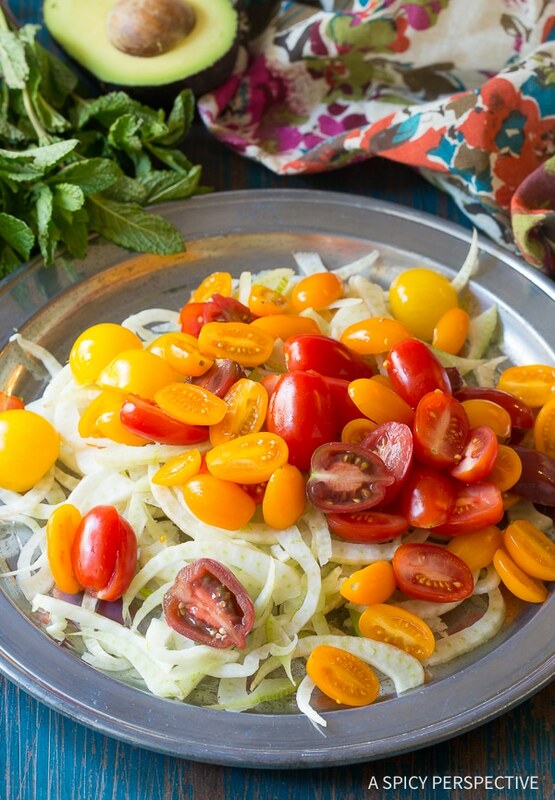 Place the shaved fennel on a large platter (or in salad bowl.) 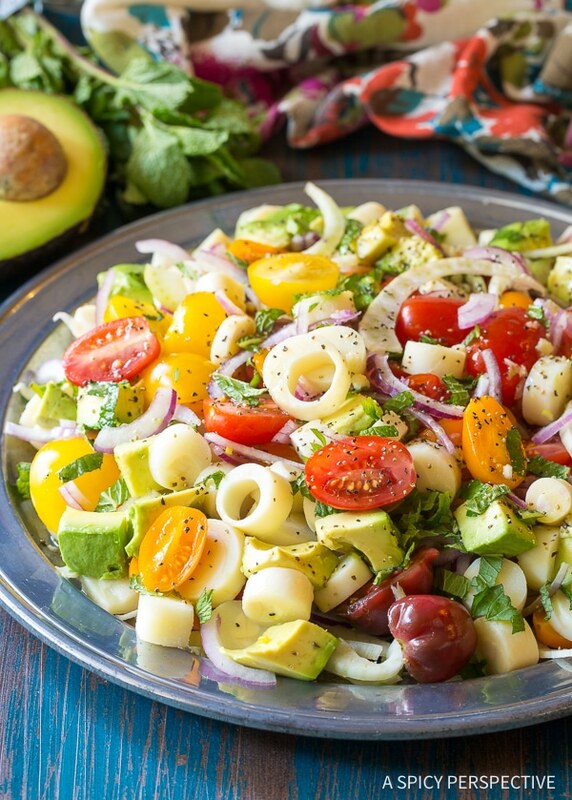 Top with tomatoes, hearts of palm, onion, avocado, and mint. Drizzle the salad dressing over the top and toss. This was delicious! Thx for the yummy recipe. Sounds delicious! I can’t wait to make it! Love it; perfect for my office lunch ! Thank you !